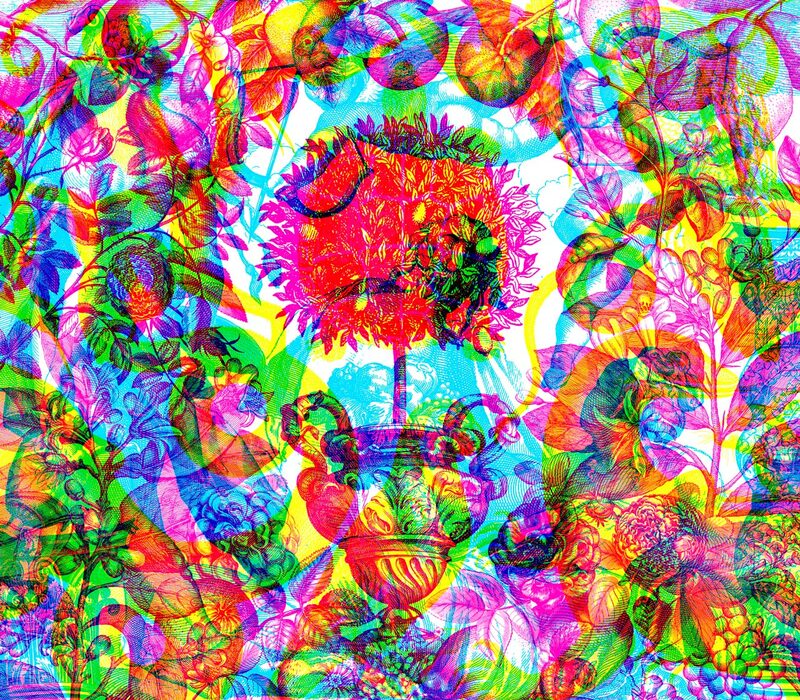 Carnovsky is a Milan based art and designer duo. They are Colombian Sivlia Quintanilla and Italian born Francesco Rugi. A concept to design radiators in the shape of a piece of writing? Well yes, that was their Love ’60 project. And could that girl really be taking a bird for a walk in its cage, swinging it with gay abandon like that? No – it’s actually a bag and each birdcage bag is handmade using natural materials : this was their artificiala project. Their close links with the music world has led to a plethora of record covers and poster designs. But it is their RGB work that continues to shine and it is this area of work that has resulted in spin-offs in art exhibitions and commerical endeavours using a variety of materials from digital to textile, card to wallpaper. The acronym RGB (red-green-blue) indicates the additive trichomatic principle of colour reproduction in print or on screen. Technically-speaking, these two creatives were interested in the optical possibilities opened up by using these three colours. The field of endeavour is vast and Carnovsky continues to invest time and mental energy to the matter, as well as having fun with it. The main concept is the layering of different patterns, each printed in one of the three primary colours. The eye only sees only fire, a blur except for a pyrotechnic mass of tricolour lines. But a filter on one of the three colours allows the visualisation of a pattern that excludes the other two colours. Each filter reveals a separate pattern. « Surfaces mutate and interact with different colour stimuli » they say. Carnovsky first exploited this concept by staging a scientific iconography from the beginnings of the modern European era (naturalism, anatomy, botany) and by playing on the thematic complementarities between vision and spirit. Because the three themes together vibrate the surface but prohibit comprehension this only happens with a colour sequence. And when it comes down to this particular game, this duo are still having fun toying with our eyes. The Carnovsky have joined diptyque for the animation of the Garden of the Hesperides. 2. What period of human history – a “distant country” wrote Racine – would you like to visit as an invisible tourist? Silvia: the 18th century, period of great innovations and discoveries, but still with an aura of mystery, maybe from the late 18th century to the early 19th and be an invisible passenger in the Beagle or other botanical-zoological expedition. 17. In your view wich painting best captures scents? 18. Which sculptor and sculpture would you choose for your imaginary museum? 20. Which characters, past or present, real or fictional, inspire you? 22. If you could offer a bouquet of flowers to a bird: what flowers for what bird? 24. What landscape do you scape to?